Offered here thanks to the Irish market's demand for compact saloons the Jetta is at its most basic a Volkswagen Golf with a saloon boot grafted on the rear. 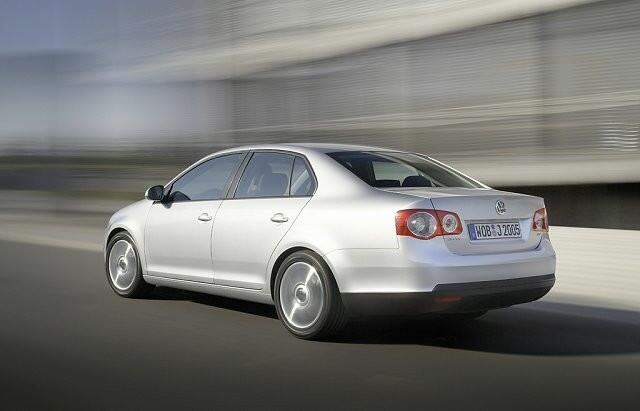 This fifth generation Jetta was introduced in 2005 and ran until 2010 when it was replaced. Offered here thanks to the Irish market's demand for compact saloons the Jetta is at its most basic a Volkswagen Golf with a saloon boot grafted on the rear. It's all but identical to its hatchback relation save for that rear end, though Volkswagen did add a more sparkly chrome surrounded front grille and bumper trim to give it some upmarket gravitas. Being based on the Volkswagen Golf means all the engines you'll find under the bonnet will be familiar. The petrol offering is a 1.6-litre unit with 105hp; it was joined in 2008 by a 1.4-litre TSI petrol unit with direct injection and a turbocharger. That TSI model is unusual though, as the majority of petrol cars sold are powered by the 1.6-litre engine. That 1.6 might make up the bulk of petrol choice in the used marketplace, but scour the classifieds and you'll come across plenty of 1.9 TDI turbodiesel cars for sale too. Volkswagen's venerable 1.9-litre turbodiesel engine produces 105hp as well, though thanks to a far healthier torque figure it feels stronger than its petrol relation. Not as smooth admittedly, but the fuel consumption of 5.3 litres/100km does make up for it. It's quite punchy (within a narrow power band) and it's a more comfortable long distance cruiser than its petrol relation. Trim levels follow Volkswagen's S, Comfort and Sport line, all coming with air conditioning, alloy wheels and electric adjustment for the mirrors and windows. Trim levels are typically a bit more generous than in its Golf relation. To drive it's almost identical to the Golf too, meaning it's surefooted, relatively refined (accepting that diesel engine's sometimes obvious gruffness) and largely unremarkable. The Volkswagen badge carries some gravitas though, meaning it feels a cut above its mainstream rivals. That saloon boot might not have the convenience of the Golf's hatchback, but it's still a sizeable offering, the Jetta proving a good size for small families. Transmission choice new was either a five-speed manual or optional six-speed automatic. Automatics aren't hugely popular and will dent economy and performance, though there are a few available if your preference is for a self-shifter. That 1.9 TDI might not be the smoothest engine Volkswagen has produced, but its decent economy combined with enough performance make it a popular choice - that underlined by the numbers for sale. Specification levels depend on budget, but you'll not be short-changed by the S model, though Comfort brings the nicest all-round level of equipment. Sport adds bigger alloy wheels and firmer suspension, which do little to add to the driving experience and upset the ride comfort. Volkswagen might always have marketed the Jetta as something a bit more special than merely a Golf with a saloon boot, but the reality is it's exactly that. While that's true if you prefer the proportions and secure boot of a saloon then it's fine, particularly if you like the virtues of strong build and image that come with the Volkswagen badge. It's an affordable used buy too - and more desirable than mainstream rivals.